We’re not exactly sure how old Kasey is. She’s a rescue dog, and her records have long since been lost in the mists of time. The vet recently looked at her teeth — what’s left of them, that is — and concluded she’s anywhere from 14 to 16 years old. So, naturally, we look for tangible signs of advanced canine age. 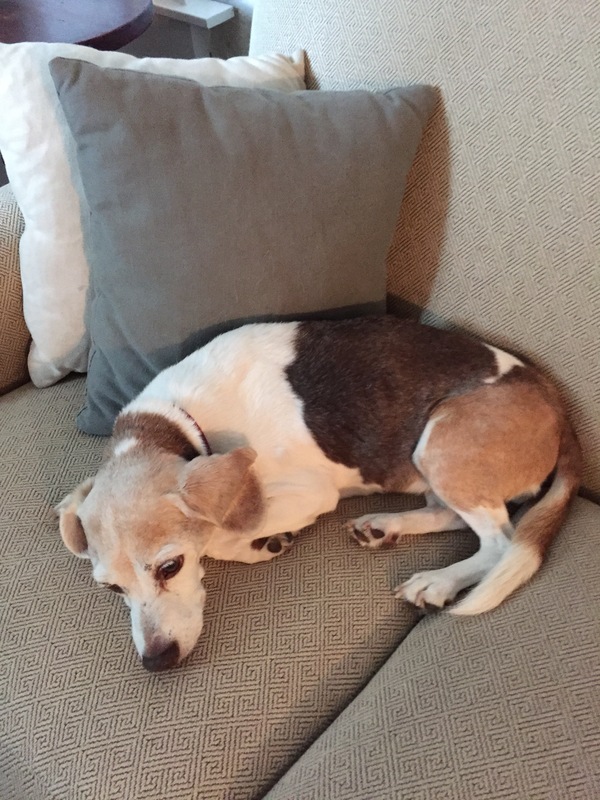 Kasey’s teeth issues and horrendous breath are one sign, and the arthritis in one of her rear legs and her general gimpiness is another. But the real acid test is sense of smell and appetite. We figure that if Kasey doesn’t react to fragrant cooked meats — like sausage, bacon, or brats — that’s a very telltale sign. So I’m pleased to report that Kasey reacted to this morning’s sausage test with a scampering visit to the kitchen, hearty barks that quickly became annoying, and rapid, gobbled consumption of some sausage bits when we just couldn’t stand the barking any longer. Our aging pooch still has some kick! What’s in a dog? Why do humans really want to have them around? I think different people would give different answers to those basic questions, and the different answers might just tell us whether a newly unveiled robot dog could become a successful product. The robot dog is built by a company called Boston Dynamics and it’s supposed to be coming soon. It’s called the SpotMini. SpotMini’s inventors obviously weren’t trying to build something that looks as much like a dog as modern technology, materials, and design will allow — the robot is bright yellow and black, has no fur, and has a concave, camera-like gizmo instead of a head. It’s a robot that clearly looks like a robot. And yet, aside from the use of “Spot” in its name, the SpotMini does have dog-like attributes. It’s got four legs, which are shaped a lot like dog legs, and it walks and prances in dog-like fashion. I’m guessing that it barks, too. So why do you have a dog? For us, it’s companionship: even though Kasey is slowing down, she’s still got a funny, unique personality that we’ve grown to love, and of course Kish enjoys putting Kasey on her lap and stroking her soft fur and making Kasey do embarrassingly undog-like things like wave her paw in greeting when I come in the front door after work. Kasey’s a member of the family, and we get a real kick out of her. It’s hard to imagine a yellow and black plastic and metal box with four legs replacing her, even if the SpotMini were programmed to have a personality. But if your primary purpose in having a dog is security, the SpotMini just might do the trick. If the robot can detect intruders and bark like crazy to wake up its owners, and then confront the intruders and freak them out when a black and yellow torpedo comes charging at them, barking all the while, you just might have a successful product. And if the SpotMini.2 version has robot jaws that can chomp down on the right people, it might be even more successful. I could see people buying a security dog that doesn’t need to be fed or walked or cleaned up after, or boarded when they go on vacation, or taken to the vet and prescribed pricey medication. In the next few years, we’re going to be seeing more and more of the robot invasion of our daily lives, and it will be interesting to see how people, and social activities generally, adapt to the coming changes. The SpotMini might just give us a peek at our yellow-and-black robot future. Dog owners make a lot of sacrifices for their beloved pooches. One of the sacrifices is grimly olfactory in nature: having to prepare dog food first thing in the morning. Kish is on the road today, so preparation of Kaseycuisine falls to me by default. That means that, rather than having my senses gradually stimulated to full awareness after a night of blissful slumber by the rich aroma of freshly brewed coffee and the crisp taste of orange juice, I’m assaulted by the sights, sounds, and smells of Kasey’s specially prepared chow. 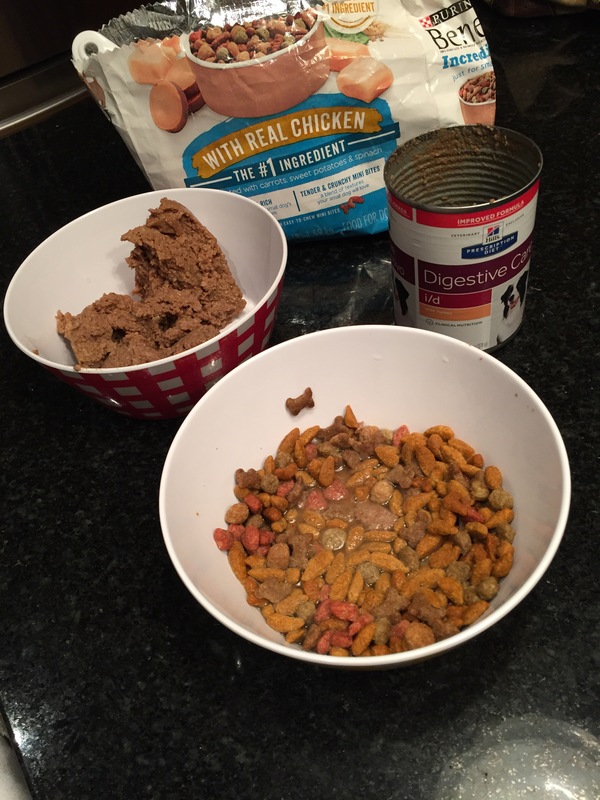 The special digestive care prescription diet canned food that falls into the bowl with a wet, sucking, disgusting, odiferous plop. The Beneful IncrediBites dry food (made with real chicken, according to the bag) that must be spooned out, moistened with water, and stirred into a kind of stew because Old Kase is down to about one tooth in the dental category and needs food that can be safely gummed into submission. And of course the food must be presented in fresh, clean bowls for our little princess, which means a key part of the assault on the senses is cleaning and washing the bowls from last night’s feast, which inevitably have minced food cemented to every inch of exposed surface by the epoxy-like qualities of dog saliva. The gag-inducing food is thoughtfully prepared and tastefully presented, none of which makes a difference to Kasey when she finally decides to eat and gulps down her food with reckless, lip-smacking abandon. But after my exposure to dog food in the wee hours, I’m ready for a walk and some fresh air. 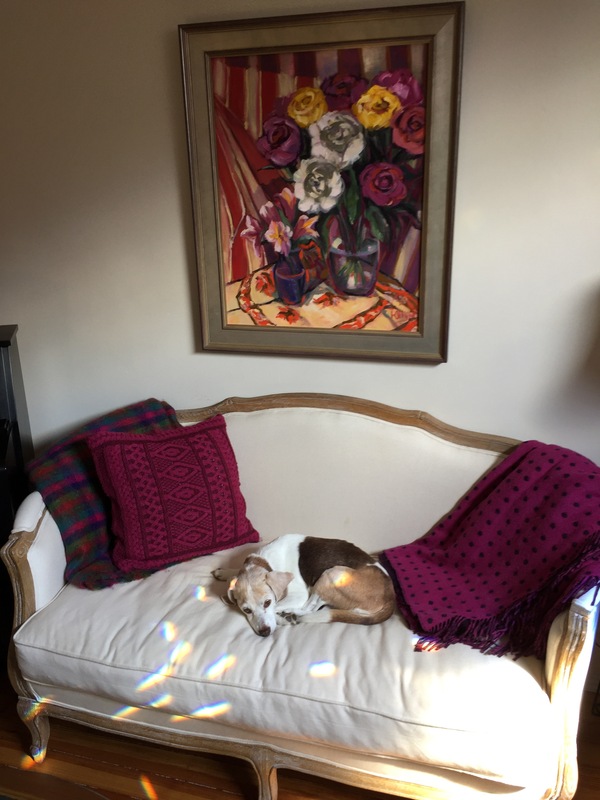 Kasey has lots of accustomed spots in our house, but this location in the front room, where the morning sun shining through some stained glass leaves the room dappled with light, is a particular favorite. Call me crazy, but in these weird and disturbing times there’s something reassuring about seeing a dog napping peacefully on a couch. We boarded Kasey while we were on our recent trip to Maine. We put her up in a really nice place, staffed by bubbly, outgoing young women, where Kasey and the other canine guests all have their own reasonably roomy spaces with their own chairs, beds, and water and dog food bowls. The spaces aren’t crates, but are more like little individual rooms that are open to the ceiling. Kasey gets walked and fed regularly, the young dog-loving employees enthusiastically track her bowel movements in a daily report, and we even pay extra for special TLC time. As dog boarding options go, it’s a nice one. And yet when we return home after one of these trips to pick up Kasey, inevitably her bark has turned into more of a squeak and she seems utterly exhausted. 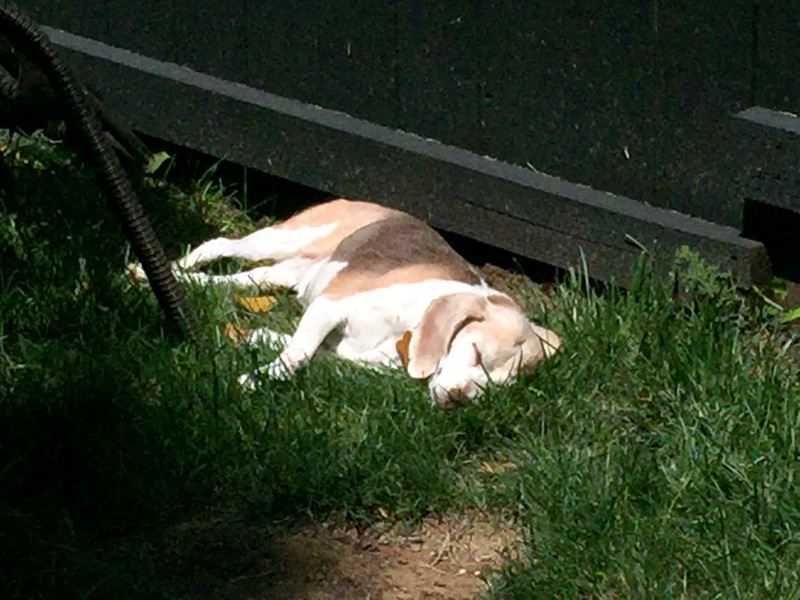 We should all wish to be able to experience the deep, total slumber that Kasey immediately falls into the instant we get home and she finds a sunny spot in the yard. Either Kasey and her canine comrades are out partying until late at night, adopting the “what happens at the boarder stays at the boarder” mentality, or she just hasn’t slept much because she misses her special warm spot in the sun — and perhaps also misses Kish and me and the sense of security and routine that Kasey associates with us. Most people tend to think of dogs as simple creatures, lacking much in the way of emotional complexity. I think the reality is a lot more nuanced. Outwardly, dogs might come across as panting, napping, pooping, bright-eyed simpletons, but down deep they may be a rich stew of angst whenever they’re taken from their comfort zones. And when a pooch is a rescue dog, as Kasey was, you wonder if every boarding experience calls up unpleasant memories of the past. Perhaps we’re projecting and feeling unnecessary guilt about our trips, and Kasey’s outward hoarseness and apparent fatigue are simply due to a stay in a place where dogs are barking a lot and it’s hard to sleep because there are lots of strange dogs, and strange dog smells, in every direction. But what pet owner doesn’t like to think there’s a reservoir of deeper feelings lurking behind that doggy exterior? 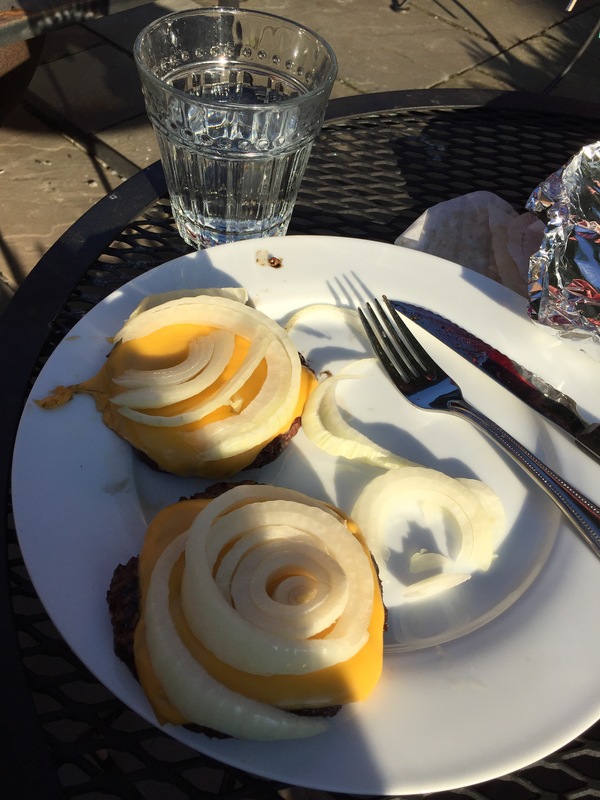 Kish is out of town, which means I don’t have to worry about mortally offending her with my breath and can indulge one of my favorite summer food combinations: grilled cheeseburgers with raw onion — lots of raw onion. I love the tang of the onion, which goes perfectly with grilled meat and cheese, and the crunch of a raw onion has a pleasant quality, too. I know my breath stinks after such a feast, but there’s no one here but Kasey, and her breath is worse than mine. I hereby pledge to brush my teeth well before encountering another human being. Mere words cannot adequately capture how good it feels to be home after a long week on the road.